This sign was just posted by dc over at Fragmentary Evidence yesterday, and I happened across it today. They've got a better picture of it, plus more nice photos from their ride home. Thanks, Gene, and for future reference, I'm a "he." Funny that we both decided to take a shot of the same sign on subsequent days. If you're looking for other cool signs, the "George the Shirt King" sign on Lakeshore is pretty good, and I don't remember seeing any photos of it anywhere. I doubt you'll run out of nice signs in Oakland anytime soon, since there are so many interesting ones around here. I shot the sign because I'd seen it on your blog. I did a double-take when I saw it in person today, because I'd just seen it on your blog: "hey! I know that sign!" Any idea what Bonanza was before? The bird looks like a stork or maybe a pelican. The Stork Club was in New York...maybe this was an imitation? There's a Stork Club in Oakland too, a few doors down from Mama Buzz on Telegraph. It's not as storied as the old Stork Club in Manhattan, but it's been around for quite a while. 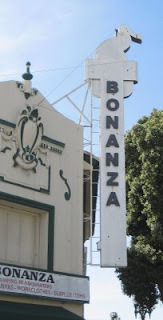 I have no clue what Bonanza was, but I wondered too. Now that I think of it, the Stork Club actually has a half-decent sign too, with some neon on it.